With daylight savings in full swing, relish in the evening with Golden Door’s cozy and satisfying creamy polenta. This straight-forward recipe pairs tart lemon and warm rosemary polenta with sweet corn, meaty oyster mushrooms, and earthy, in-season rainbow chard. Add some roasted tomato sauce and a drizzle of a simple balsamic reduction to enhance this soothing and hearty meal, perfect to brighten and warm any dark, cold evening. 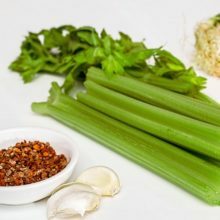 Bring vegetable stock to a boil in a medium saucepan. Meanwhile, spray a small sauté pan with olive oil and heat over medium-high heat. Add the onion and garlic and cook, stirring until slightly translucent and fragrant, but not at all brown, about 2 minutes. Scrape the onion and garlic into the stock. Whisking constantly, pour in the cornmeal in a slow, constant stream. Reduce heat and simmer on low, stirring often, until thick and creamy, 10-20 minutes. Stir in Parmesan, olive oil, rosemary, thyme, and lemon zest. Season with salt and pepper. Cover and set aside. Spray a large skillet with olive oil and heat over medium-high heat. Add the mushrooms, corn, and red onion and cook, stirring occasionally, until the mushrooms soften and the corn is cooked through, 4-5 minutes. Add the chard and cook until just wilted and beginning to release liquid, about 2 minutes. Remove pan from heat and stir in lemon juice and olive oil. Season with a pinch of salt and pepper, or to taste. To serve, divide polenta among four plates or wide, shallow bowls. 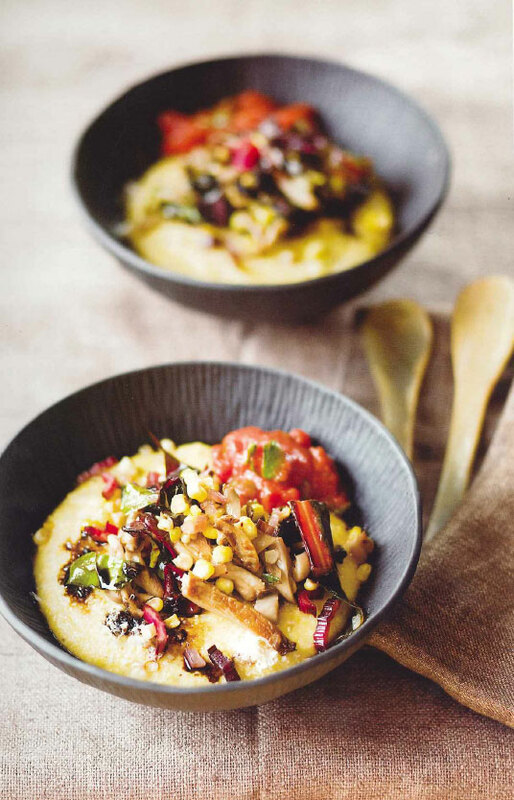 Spoon the sautéed mushroom, corn, and rainbow chard mixture on top or alongside polenta. Spoon 2 tablespoons of tomato sauce on top of polenta or vegetables, and drizzle a little balsamic reduction.